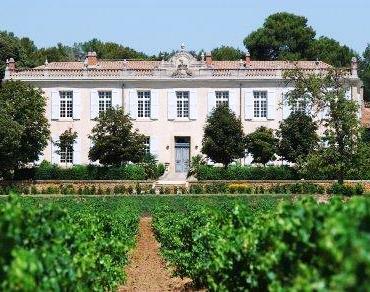 Chateau Beauchene is one of the older vineyards in the Southern Rhone Valley as the estate was originally founded in 1794! However, the Bernard family, the owner of Chateau Beauchene dates be even longer, as they can be traced all the way back the 15th century. Michele Bernard and Dominique Bernard have been in control of the estate since 1971. Today, their daughter Amandine Bernard is working with her parents at the property and it is expected that she will be placed in charge of managing the winery. Chateau Beauchene owns 8 hectares of vines in Chateauneuf du Pape and 72 hectares of vines in the Cotes du Rhone appellation. Chateau Beauchene produces 3 red Chateauneuf du Pape wines and 1 Chateauneuf du Pape white wine. Chateau Beauchene Vignoble la Serriere is made from a blend of 65% Grenache, 30% Syrah and 5% Mourvedre. The wine is aged for 12 months in used, French oak barrels before bottling. The production is limited with about 175 cases of wine produced per vintage. Chateau Beauchene Grande Reserve is made from a blend of 80% Grenache, 15% Syrah, and 5% Mourvedre. The vines average between 50 to 100 years of age. The terroir a mix of galets and sand soils. The wine is aged using a small portion of new, French oak casks, while the remainder of the wine is aged in used, French oak barrels and tank for 18 months. The production is on average about 800 cases of this wine per year. Chateau Beauchene Hommage a Odette Bernard is culled from the best barrels that would normally be placed in the Grande Reserve. The wine receives an extended period of barrel aging as well. The wine is produced from blending 85% Grenache with Mourvedre. The terroir a mix of galets and sandy soils. The wine is aged using a small portion of new, French oak casks, while the remainder of the wine is aged in used, French oak barrels and tank for 18 months. Chateau Beauchene la Serriere Blanc is made from a blend of 30% Bourboulenc, 20% Grenache Blanc, 30% Roussanne and 20% Clairette. On average, the production is close to 125 cases of wine each vintage. Chateau Beauchene can be enjoyed on the young side. Young vintages can be popped and poured, or decanted for about 1 hour, give or take. This allows the wine to soften and open its perfume. Older vintages might need very little decanting, just enough to remove the sediment. Chateau Beauchene is usually better with 2-4 years of bottle age. Of course that can vary slightly, depending on the vintage. In the best vintages the wine should be consumed within 3-12 years after the vintage. Chateau Beauchene is best served at 15.5 degrees Celsius, 60 degrees Fahrenheit. The cool, almost cellar temperature gives the wine more freshness and lift. Chateau Beauchene is best served with all types of classic meat dishes, veal, pork, beef, lamb, duck, game, roast chicken, roasted, braised, stewed, and grilled dishes, smoked meats, barbecue, sausage, cassoulet, eggplant and tomatoes. Chateau Beauchene is also good with Asian dishes, hearty fish courses like tuna, mushrooms, pasta and cheese. The white wine of Chateau Beauchene is best served with a myriad of different seafood dishes, shellfish, crab, lobster, sushi, sashimi, chicken, pork and veal, as well as Asian cuisine and cheese. Chateau Beauchene also produces 4 red Cotes du Rhone and 2 white Cotes du Rhone wines. Spicy, peppery, sweet, round red fruits with energy and lift are found in this medium bodied, open styled wine. The wine was made blending 80% Grenache, 15% Syrah and 5% Mourvedre. Earthy, peppery, sweet, ripe red fruits with freshness, soft tannins and a juicy, spicy finish is found here. This will be delicious on release. The wine was made with 80% Grenache, 15% Mourvedre and 5% Syrah. There is a nice sweetness to the black raspberries, coupled with spicy, peppery nuances that give more complexity to the wine. Polished, fresh and lively, there is lift and sweetness. The wine was made blending 80% Grenache, 15% Syrah and 5% Mourvedre. Medium bodied, and with loads of already accessible sweet, ripe, kirsch, the wine was made with mostly Grenache, and blended with Syrah and Mourvedre. Correct, with a sweet and fresh palate presence, this will be fine to drink on release. Medium bodied, early drinker with a sweet red cherry, kirsch and herbal character, soft textures and a forward personality that will make this best in its youth. Early drinking, medium bodied, kirsch filled wine from a Grenache dominated blend, along with Syrah and Mourvedre. The wine is correct, focused on its red berries and garrigue but it is light on its feet and should be best in its youth. Already showing its stuff, the wine is medium bodied, with a round blast of black raspberries, spice and a strong herbal component. Medium bodied, fresh, bright, crisp style of wine, with a black cherry, raspberry, wild strawberry center of fruit that is probably at peak today. Easy drinking charmer, with a soft, round, open, kirsch, spice and black raspberry personality. Medium bodied and ready to go, drink this on the young side for the sweet, ripe, soft, red cherries.